Honor Reigns Supreme 2019 takes place at Cabarrus Arena tonight in Concord, North Carolina. 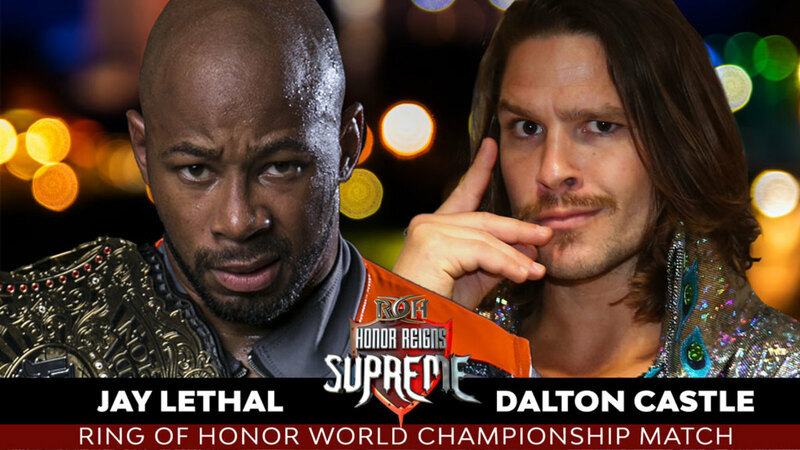 After winning a four-corner survival match on ROH TV last week, Dalton Castle will receive the first title shot of the new year as he challenges ROH World Champion Jay Lethal tonight. Newly crowned Women of Honor World Champion, Kelly Klein, will also defend her title against Jenny Rose in a street fight. The recently signed PCO and Brody King will appear, teaming with Marty Scurll as Villain Enterprises against The Briscoes & Silas Young. Also on the card: ROH TV Champion Jeff Cobb faces Shane Taylor, Jonathan Gresham and Rhett Titus in a four corner survival match (if Cobb doesn't win, the winner will receive an instant TV title shot), new ROH signee Bandido takes on PJ Black, Flip Gordon faces Tracy Williams, Mark Haskins faces Beer City Bruiser, NJPW’s Juice Robinson & David Finlay wrestle Best Friends (Chuckie T & Beretta), and ROH Six-Man Tag Team Champions The Kingdom take on Shane "Hurricane" Helms, Delirious & Luchasaurus in a proving ground match. Our live coverage begins at 7 p.m. Eastern time. Hollis cut a promo on the ROH announce team before the match. They challenged any three other men to have a match with them. The Shinobi Shadow Squad Cheeseburger, Nova and Isom came out and the match began. A solid opener. Isom was most impressive. It is insane that he has only been wrestling for about a year. Everyone in the match shined a bit despite the match’s length, which was under 10 minutes. 3S won the match with Oyasumi. Not the greatest match in the world but not the worst either. After the bell, Bruiser shouted about “having a fight” and didn’t want to take part in Haskins’ “British crap.” He also told Haskins not to use any submissions, because apparently that doesn’t count. Bruiser did his “I can’t bite, I ain’t got no teeth” spot he always does. Haskins’ striking and submissions looked great throughout the match. He landed a stiff closed-fist into Bruiser’s jaw at one point. The crowd was silent for good portions of this match. Whenever BCB would yell things about beer or “his bar,” it seemed to fall flat. He wouldn’t get heat unless he was doing power moves or missing high spots from the top rope. Haskins won the match with a diving double stomp. The two shared a beer after the match. Robinson gave his hat and sunglasses glasses to a young fan in the front row before the match. This was a sweet babyface moment. The crowd woke up a bit for this one. I’m not sure what exactly it was, but these four wrestlers had a much different presence than the guys in the matches before. A stronger, more believable presence. Take that for what it’s worth. Beretta and Robinson continued building their NJPW U.S. title program during this bout. Beretta looked very good throughout and hit a very nice double stomp onto Finlay as Finlay hung over the guardrail outside the ring. Best Friends did a double elbow drop spot and the ROH production crew did a hard zoom out, parodying what NJPW does with Kazuchika Okada when he does his ”Rainmaker” pose. The announce team put Beretta over as being more aggressive than usual. Obviously indicative of a future NJPW storyline direction. Robinson used a forward-fall snap DDT, something I haven’t seen him use much before. Beretta took a gnarly bump on his head for this. At this point in the match the crowd was at its most voluminous, lots of “Juice” chants and clapping. Many of the final sequences in this match were between Beretta and Juice, possibly answering what I questioned earlier. They had good chemistry together. Finlay took the surprise win with a suplex into a shoulderbreaker on Chuckie T. This was another solid one. Beretta and Juice jawjacked a bit over the NJPW U.S. title but then they shook hands. No one shook Finlay’s hand, which he looked to be bummed about. - Colt Cabana and Ian Riccobani announced that ROH will be working with vettix.org is this year. This means that if you’re a veteran you’ll be able get free tickets to ROH shows. Kenny King joined Riccobani and Cabana on commentary for this match. He trash-talked Flip Gordon and said he wasn’t ready to challenge Jay Lethal for the ROH World Heavyweight title. Again, the crowd was either silent for much of this match or this event was poorly attended. Gordon sold his knee hard early on after a springboard dropkick. He rolled out of the ring early on and referee Todd Sinclair called the match. Kenny King talked a lot of trash on Gordon on commentary. It seems like they’ll be working a program together soon. The Green Team vs. The Purple Team. Delirious ran around the ring before the match. Taven wiped is rear-end with a piece of Delirious’ gear. Luchasaurus used a few high kicks on TK O’Ryan. Not all of them connected, and he missed as many kicks as he landed. Once the novelty of a big man doing small man moves wears off it just gets hard to watch. Delirious did comedy spots. Helms looked solid anytime he was in but he is very out of shape these days. Marseglia used a stomach claw on Delirious. The last time I saw this move used seriously was while watching an old Gorilla Monsoon match. Taven was the star of this match in that he was barely in it but got reactions to pretty much everything he did. Every move was sharp, every dig at the crowd responded too. Delirious severely botched a suplex and dropped TK O’Ryan on his head. This looked scary. Luchasaurus used a great looking moonsault to the floor towards the end of this match. O’Ryan and Marseglia hit House of 1,000 Corpses for the win. This was mostly bad. Taven and (sometimes) Helms were the highlights. PJ Black, a man who once pinned John Cena, walked to the ring to almost zero reaction. People were excited for Bandido before the bell. Once the match began both began rapid-fire lucha-esque sequences. Bandido did a backflip into a headstand, later followed by a plancha, a tope suicda and a Fosberry Flop where he landed on his feet. That was the sequence, a lucha buffet. Black looked great. These two complement each other well, and I feel if they work together for a month or two they could develop an excellent program. The crowd finally gave Black some heat as he slowed the pace of the match with some submissions and flexing. He mirrored the “Set of Three” sequence Bandido hit earlier, including a drfopkickthrough the ropes and a tornillo. After Bandido hit a springboard corkscrew body press into the ring, the crowd came to their feet. Bandido botched one of his innovative twisty moves. It’s one of the biggest dangers with the style both wrestlers are applying; if you screw it up, it becomes so much harder to suspend general disbelief in the match itself. Black botched a top rope Frankensteiner but it still looked cool. The crowd chanted “This is awesome” for the first time afterwards. Bandido won the match with a moonsault fall away slam from the top rope. Both tried to do a lot in this match but ended up botching a number of spots. Kudos to Riccobani and Cabana for quickly covering up almost every time. Despite the botches, the crowd seemed to like this match the best so far, and it was quite entertaining overall. A good match with Bandido getting very over. Shane Taylor, originally booked for this as well, cut a promo beforehand. He essentially said he’s too good for the match, verbally downsized everyone in the ring and then walked to the back. The match became a three-way from this point, apparently. Gresham tried using a flying cross body block on Cobb who no sold it completely. It sounded like someone threw a steak at another bigger steak. Gresham sold it hilariously. Cobb used a hanging superplex on Titus. Aside from big high spots like this, the crowd was mostly silence, waiting for their cues. Cobb won the match after using an impressive deadlift piledriver and Tour of the Islands on Titus. This was all very good, despite the somewhat confusing Shane Taylor booking. Each wrestler brought their above-average games tonight. Silas Young walked out after the match, but Taylor snuck into the ring and ambushed Cobb before Young did anything of note. TV Title program between those two looks to be coming soon. Kelly Klein came out with Camp Klein, her training posse. This was a fresh change of pace on the card in that it was a pure brawl, much more of a “real fight” than whatever Beer City Bruiser was clamoring for earlier. The wrestling itself wasn’t pretty but it didn’t need to be here. Both wrestlers worked hard and mostly brawled around the ring. Klein choked Rose with a bungee cord, then put her in a cravat using the weapon. Rose fought back and used a number of excellent looking suplexes both in and out of the ring. She tried hard to engage the relatively shy and/or small crowd. Rose later tried to splash Klein through a table but the table wouldn’t break. Rose then jumped onto Klein’s back while they were both on the apron and they both crashed through the table. While the spot was wild, it was painfully obvious that Klein was setting up and calling the spot on camera. I’d say this was more of a production faux pas than anything; they should have switched angles. Rose superplexed Klein onto a pile of chairs. This received an “R-O-H” chant. Moments later, Klein used K-Power onto a pile of chairs on Rose to retain. Good match overall that featured some brutal spots. One thing that really brings ROH shows like this down is when the production crew abruptly ends a wrestler’s music and begins another’s. It comes off as very amateurish. PCO and Mark Briscoe had a seemingly endless chop battle in the beginning of this match. He and the other Villains were highly over with this crowd. Scurll and King did a cool superkick-gourdbuster combo on the apron. PCO then took a massive somersault bump onto the apron after Mark Briscoe flipped him from the top turnbuckle. It was one of the spots you watch and can’t help but cringe or squint your eyes in pain. Both Briscoes were fantastic as per usual; their consistency should be noted and praised. Young added a nice heel flavor to their team and throughout the bout. King did some insane big-man flying, then assisted PCO in a high somersault senton to the floor, all extremely impressive. Jay Briscoe was cut under his eye halfway through this match. It looked like hardway blood. Young did a nasty, nasty looking Canadian Destroyer to PCO on the apron. PCO is taking Mick Foley level bumps these days. Brody King press slammed Mark Briscoe off the top rope through a table which got a loud reaction. The match finished with PCO landing a massive, almost delayed moonsault onto Mark Briscoe for the pin. PCO was so over with this crowd that they were chanting his name even after the spot. This was an exciting, almost late-90s ECW style bout of mayhem. Fans were essentially split between the two with Lethal sounding to have a slight edge. The two dashed at each other after the bell. Castle landed a huge German suplex within the first 20 seconds. Lethal whipped Castle into the guardrail and looks to have smashed into a ring crew member. Lethal used Lethal Injection very early on for only a two-count. I’m not sure why they chose to do this spot so early. Was it to get Castle over as a really strong challenger, or is the move just not that effective anymore in kayfabe terms? The pace slowed in the middle of this match, something I’ve noticed Lethal employing in his past few big-card matches. Despite the aforementioned mostly-silent crowd, he was in total control of the bout’s tempo, controlling the ups and downs clearly and with conviction. Aldis did a good job on commentary introducing the narrative that Lethal might have been playing rope-a-dope early on, adding nice depth to this rather mild match. The crowd eventually heated up towards the end of this match, somehow. Castle reversed Lethal Injection into a high angle release German suplex for a close two-count, but Lethal finished Castle off with one last Lethal Injection for the win. This felt more like a decent TV match than a prestigious world heavyweight title match. The match itself was mechanically tight but the crowd was dead for the majority of it. The final sequence was very good and both wrestlers got good reactions, but overall it was unfortunately underwhelming. This was a sometimes good but mostly lackluster show. There were a few noteworthy moments and they seemed to all involve weapons, innovative spots or wrestlers taking sick bumps. It’s hard to see the finish line at Madison Square Garden from here. Keep an eye on ROH’s roster as they rebuild in advance of what could be one of their most important years to date.